Vintiques Northwest Nationals car show is held in Yakima every August for the last 32 years. One of the West Coast's premier Hot Rod shows. Sarg Hubbard Park and the Yakima Greenway has recreation fun for all members of the famliy. Just 21 miles form Yakima on I-82 is the Zillah Teapot Gas Station. Built in the 1920's as a protest to oil dealings it once was the oldest operating station in the United States. These Indian Painted Rocks are just west of Yakima. Their origin is unknown. Just 25 miles south of Yakima on Highway 97 is Toppenish, "Where the West Still Lives". Over 67 murals grace various city building walls. The Yakima Area Arboretum just minutes from downtown. Over 46 acres and over 2000 plant species. 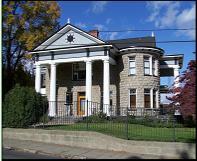 The Rosedell Mansion now the Rosedell Bed & Breakfast an important part of Yakima history. The Gilbert House a look into early Yakima.